A lovely lady who is friends with a family that we have supported, has kindly offered to organize an event for us as a way of saying thank you. The event is being held this Saturday (14th September 2013) at St Michaels Hotel, Falmouth. 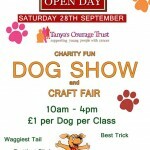 It is almost time for our 3rd annual Fun Dog Show. For the second year running, we are holding the Dog Show in conjunction with Griggs Country Store Annual Open Day.